This is the home of The Silk Route Arabian Cabaret Bellydance show. 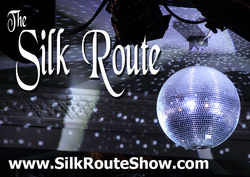 It is with a very heavy heart that we have to announce that the next Silk Route Show, scheduled for Sunday 22nd November, is unfortunately cancelled. Our venue, the Bedford, will no longer accommodate the show and we are therefore forced to withdraw the November edition. This is not a decision that was made lightly and apologies to everyone that was looking forward to what promised to be a great evening. For over a month we've spent many long hours in search of an alternative venue, one that will still offer the qualities of comfort, convenience and distinctive atmosphere that our Cabaret format is renowned for. It has become clear that it's not currently possible to recreate the vibe of our showcase environment elsewhere, without making unacceptable choices (such as charging performers or reviewing our guest list policy). Such choices would have changed the spirit of the show. We believe in the Silk Route as a platform for dancers of all levels to showcase their abilities and promote themselves, a hub and forum for the belly dance community to come together. For the time being, our journey has arrived at a crossroads but hopefully this break for the Show is not for good! Please stay tuned as we continue to review options and alternatives for 2016. Dance and associated dance forms, it is now an established platform for both experienced and exciting new talent. .....Read more.